Think about this, you retrieve the DVD Big Hero 6 from its protective case because your kid wants to watch it for the 50th time, only to find it's unreadable due to natural wear and tear. Exaggeration, maybe. But as is known to all, DVD disc is a fragile thing. So DVD duplication sounds a good idea so that you'll have a backup DVD in case one is ended up due to any unexpected damage. The only problem is how to duplicate DVD disc without losing quality. Read on the article to learn the best DVD duplicator software to copy DVD to DVD in 1:1 ratio. 2. To backup DVD to another disc in 1:1 ratio, select a blank disc of the same size and type as that of the original one. 3. The biggest challenge to most DVD duplication software to clone DVD movies to DVD disc is the DVD copy protections imposed on most movie DVDs. For example, the Big Hero 6 as well as other Disney movies are protected by the strong Disney X-project protection. In other words, to duplicate a DVD, special DVD copy software is needed to unlock protection from DVD measures and extract the ISO image. Note: keep the above instructions in mind and follow the guide with the DVD duplicator below, you can rip protected DVD to DVD easily without losing quality. However, the DVD movie disc duplication should be done for personal use only. Considering the requirements of duplicating DVD movies to ISO image without the DVD protection troubles, here we use MacX DVD Ripper Pro. This DVD duplicator can help duplicate DVD disc by easily backup and copy DVDs homemade or protected by all protection measures like DVD CSS, region code, RCE, Sony ArccOS, UOPs, Disney X-project protection etc. It will make 1:1 DVD copy to ISO image for further duplication, as well as to MP4, H.264, MOV, M4V, FLV, MPEG4, AVI, QT, MP3 and various other formats for playback on iPhone X/8/7/SE/6s/6s Plus/6/5s/5, iPad Air/Air 2, Android phones tablets etc. With 36x faster speed. 1Before DVD to DVD cloning process, get the DVD copy software free download on Mac (Mojave incl. ), or download the windows version for PC users (Windows 10 incl.). Launch the DVD duplication software and Insert your DVD movie you want to duplicate. Click "DVD Disc" or "DVD Path" button to import the DVD files. 2Choose Output Formats. To copy/duplicate DVD to DVD, just choose ISO image as the output format. For other purpose, you may backup and convert DVD to MP4, FLV, MOV, AVI, MKV, WMV, 3GP, iTunes, mobile devices or even directly copy DVD to hard drive etc. 3Choose Output Folder. Click "Browse" button in output setting area and select a destination folder to save your ISO image file. 4Start DVD duplicating. Click "RUN" to start to copy protected DVD on Mac or Win. The whole DVD disc duplication process is super-fast. For windows users, there are numerous DVD duplicators available for users to choose from. For Mac users, they may face with fewer choice. 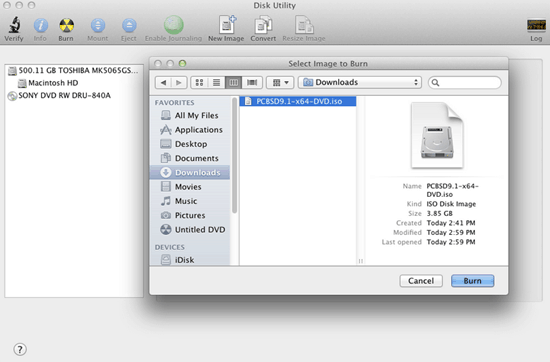 Fear not, the built-in Disk Utility is the ideal option to burn DVD on Mac. No extra software required. 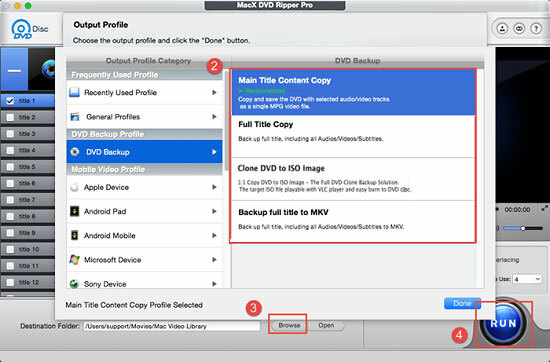 Here's how to rip DVD on Mac and make DVD disc. Step 1. Launch this top DVD burner for Mac: head to Applications > Utilities > Disk Utility. Step 2. Insert a blank DVD or CD into the drive. If the ISO file is less than 4.38GB, a single layer DVD disc 5 is enough; if the ISO image is larger than 4.7GB, you will need a dual layer DVD, namely DVD 9. Step 3. Drag and drop the iso file to the left pane in Disk Utility. Now both the blank disk and the .iso should will display in the Disk Utility. Step 4. Select the .iso file you want to clone to DVD disc, and click on the Burn button. The Disk Utility will start the DVD disc duplication process automatically. After the DVD is duplicated, the disc will be ejected from the drive. If the DVD is protected, switch to DVD decrypter Mac. Note: Disk Utility can also be used as the DVD copy software in Part 1, however, for homemade DVD only. For commercial movie DVDs with copy protections, the DVD to DVD burn task will still need a special DVD backup software to handle new movie releases on dvd. Notice: We only advocate copying and duplicating protected DVDs under the concept of Fair Use and don't encourage any illegal reproduction or distribution of copyrighted content. Please abide by the local DVD copyright law before doing it. You can put the DVD duplication file to iPhone iPad etc. with the help of MacX MediaTrans, which offers an easy way to mount iPhone as hard disk drive, as well as iPad iPod etc. to store duplicated DVD movie files folders to play on the move. It also enables you to transfer movie to iPhone iPad etc. with no size limtis one by one or in batch speedily on Mac/PC. MacX DVD Ripper Pro is the best DVD copy software which can freely rip and convert any new copy-protected DVDs to various video formats (MP4, MOV, MKV, AVI, etc) and portable devices with original quality.